This early evening, after yet another day of rain, thunder and enough humidity to give yourself a facial by walking out your front door, we were treated with the sun peeking out from chunky clouds. Having forced myself to clean the apartment and do laundry versus sitting on the couch catching up on the last three months of Bon Appetit and Gourmet, I decided to treat myself by heading to a nearby elementary school to hit some golf balls on the soccer field. On my way to the school I stopped by the local Starbucks to pick up an iced coffee to sip on while I searched all over for my lost balls which, given my current slice and shank, could end up anywhere on the field. While walking along a chain link fence at the rear of the field looking for three of my hot pink golf balls I heard hit the fence, I noticed poking through the fence, tendrils of wild raspberry bushes that were absolutely loaded with ripe berries. 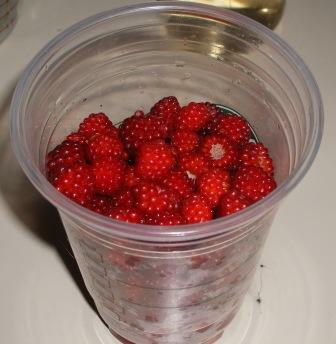 I let out a squeal of delight because earlier in the day I had wanted to get some raspberries at the store but they were too expensive and now, right in front of me were hundreds of berries for the taking. The problem was I didn't have a bowl or container with me. Pondering the problem I took a sip of my iced coffee and then it struck it me. I did have a container and it was right in my hand, the plastic cup for my iced coffee. Taking one last sip of my coffee, I dumped it out and started picking. Twenty minutes later I had one raspberry filled tall coffee cup with only about thirty tangy sweet berries finding their way to my mouth. 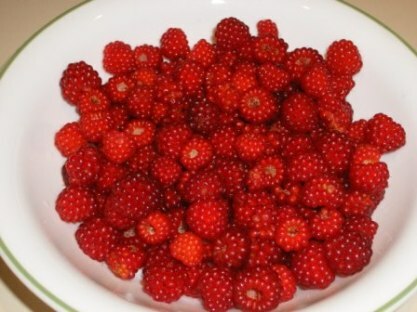 Getting home, I thoroughly rinsed the berries to remove any husks, bugs and other debris left over from the vines. I don't know what I'm going to do with my raspberries yet. I'm sure inspiration will come to me but in the mean time, I'll just look at how vivid red the berries look in their white bowl. Weekend Cat Blogging: Where Has August Gone? !